2009. Latest in our Matt Borghi reissue series. The Phantom Light is a work that’s comprised four compositions with titles derived from some of the most remote lighthouses on the northern Great Lakes. The works are inspired by sailor’s tales of being adrift on The Great Lakes during storms, and catastrophic weather. Sailors, looking out on the horizon for a sign of life, a light of hope, aimed their ships towards the safety of these phantom lighthouses hoping to get to a safe harbor. Often times these phantom lighthouses just lead to a rocky shoal and a watery death. These “phantom” lights have been a thing of myth for as long as The Great Lakes freshwater seas have been sailed. 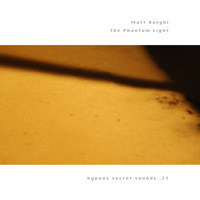 In many ways, The Phantom Light is a sequel to Huronic Minor, as Great Lakes lore, and Matt Borghi’s own experiences on The Great Lakes were the creative impetus for this work.